Preview. Completely revised the preview engine. 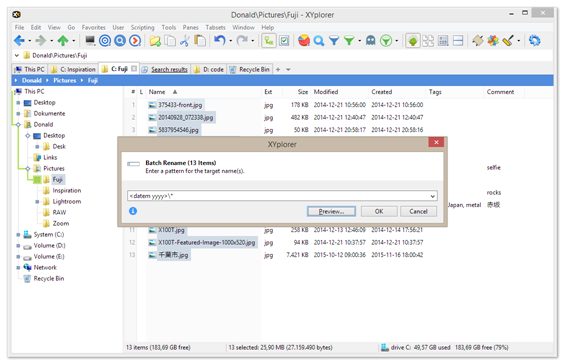 Now you can preview Office, Audio, and Video files using the available preview handlers. A huge improvement over previous versions, notably for Office files and document formats like RTF, PDF, and XPS. PDF preview in the Preview Tab on the Info Panel. 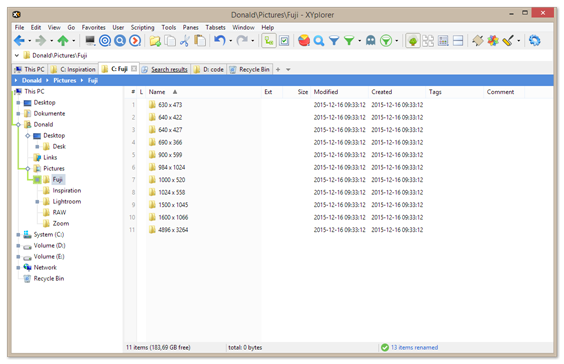 Note that registered preview handlers (32-bit) are needed for the new preview to work. These are usually installed along with the software you use to view and edit the file types in question. So, for example, to preview PDF files you need some PDF-viewer/editor software installed in your system (PDF-XChange is highly recommended). To preview MS Office files you need MS Office installed, to preview WordPerfect files you need WordPerfect installed, etc. Tip: ShellExView, Nirsoft’s Shell Extensions Manager, is a valuable tool if you want to find out more about your available preview handlers and other shell extensions. Floating Preview and Full Screen Preview. Now it supports previewing Office, PDF, Audio and Video, Font, and Icon files. And, of course, you still can view your photos with it. Here are some examples for the Floating Preview (F11). The Full Screen Preview (Shift+F11) works just the same. 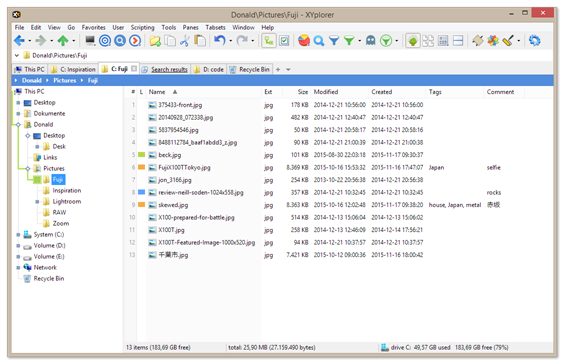 Note that the Floating Preview status bar can be shown including the tag bar allowing you to tag and comment the previewed files right from the preview window. PDF preview with status bar and tag bar. Icon preview (transparency grid can be toggled by Ctrl+T). Tip: You can snap the Floating Preview (as in the above screenshots) to the main window by pressing Ctrl+Shift+Alt+F12 while the Floating Preview has the focus. Batch Move. 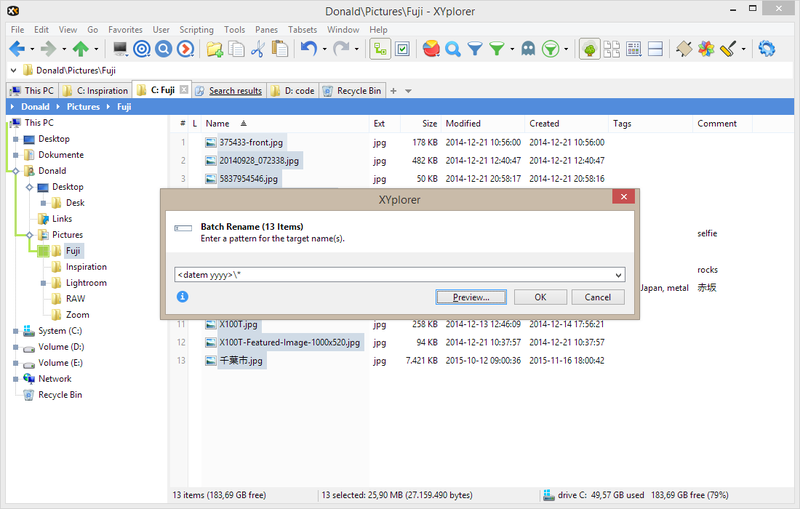 This feature allows you to automatically distribute a large number of files by certain criteria to automatically created folders, in one go. A neat freak’s dream. First, ensure this option is ticked: Configuration | Sort and Rename | Rename | Allow move on rename. 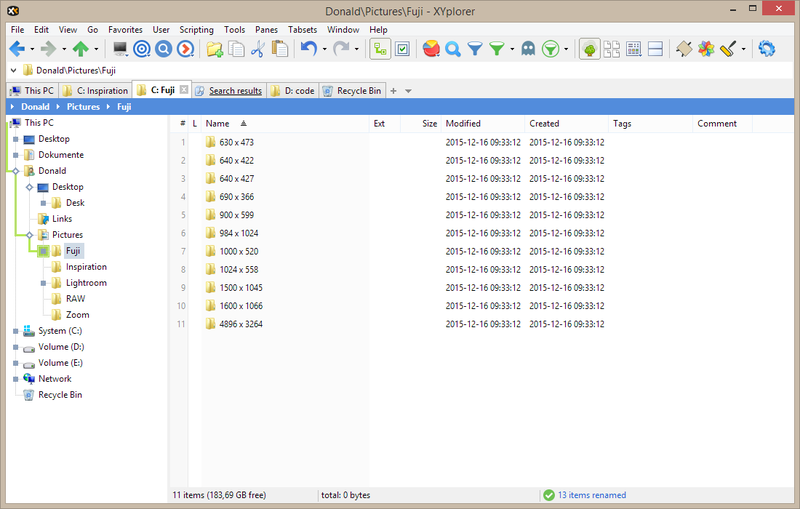 OK, say we have a bunch of pictures and want to move them into folders by the year they have been last modified. 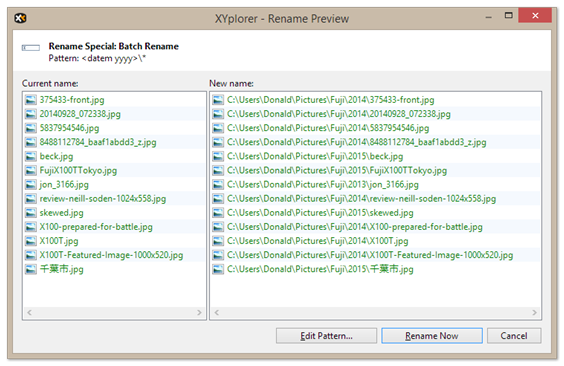 Easy: Select the files, press F2 to open Batch Rename, enter <datem yyyy>\* as pattern (the pattern denotes the 4-digit modified year; note the backward slash: it makes the target names have a path different from the source names, hence files will be moved), and click OK. Done! 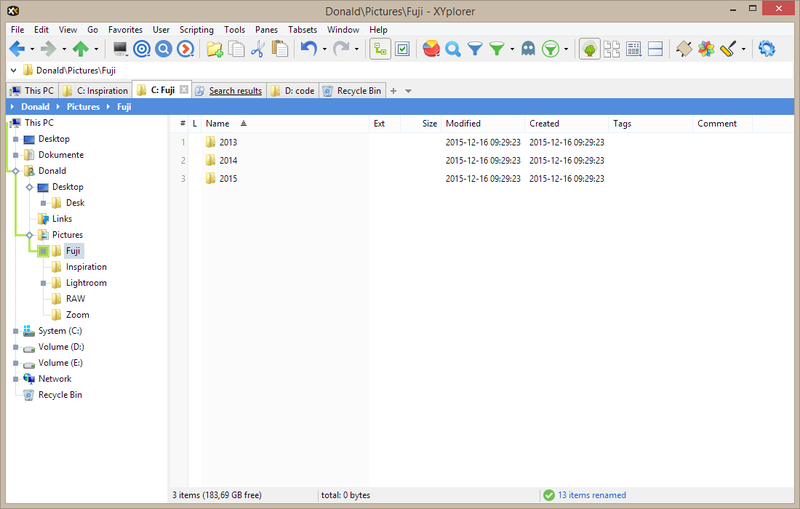 All necessary folders are automatically created and the files are moved into them according to their modified year. A bunch of pictures from different years. Select all, press F2, enter the pattern. Have a look at the preview to get an idea of what’s going to happen. Finally press OK to make it happen. Voilà! 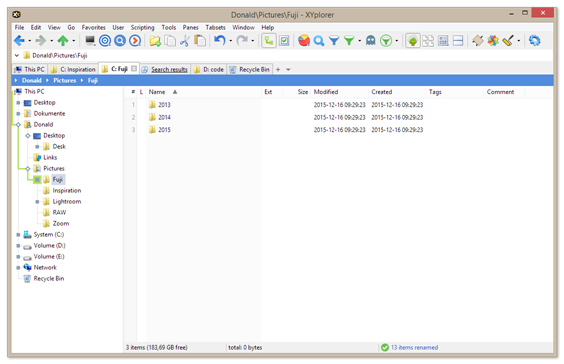 Three folders have been generated and the have been moved into them. Note that the status bar says "13 items renamed". 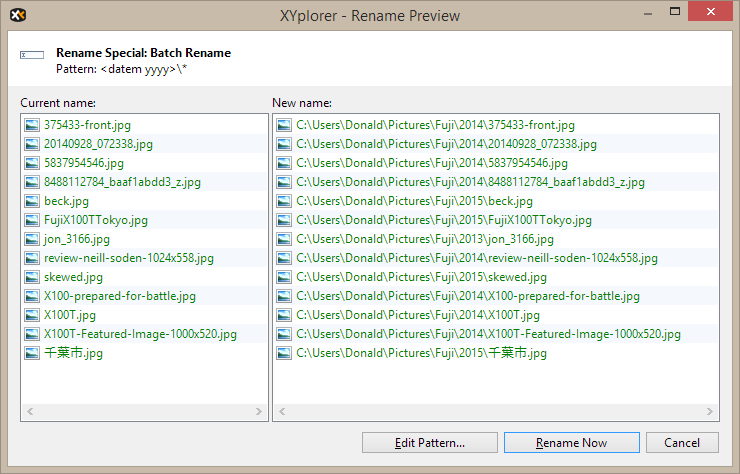 Technically, Batch Move is a Move on Batch Rename. Finally press OK to make it happen. Voilà! 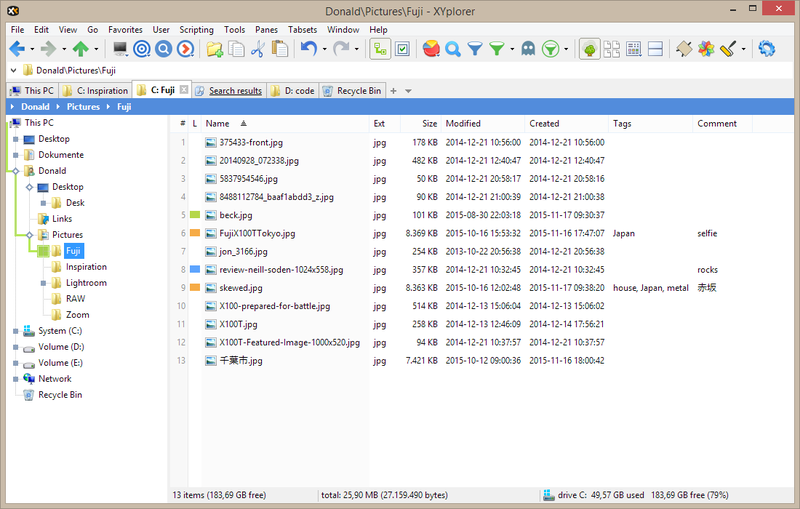 The 13 pictures have been distributed into 11 folders. Multilingual Support. Added support for Finnish. 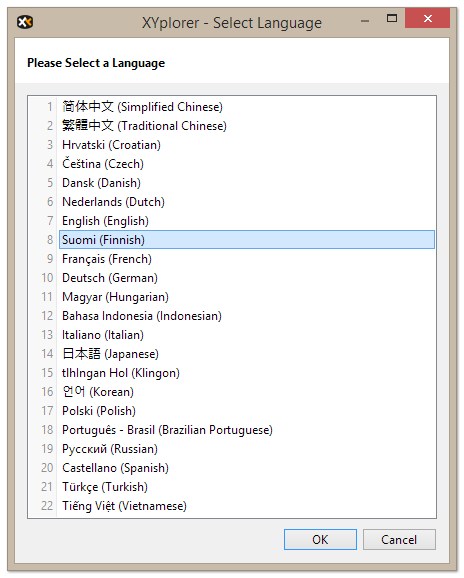 How to load the Finnish language into XYplorer: Click menu Help | Select Language, then select Finnish from the list of available languages. Done. No restart required. Multilingual Support. Added support for Catalan. 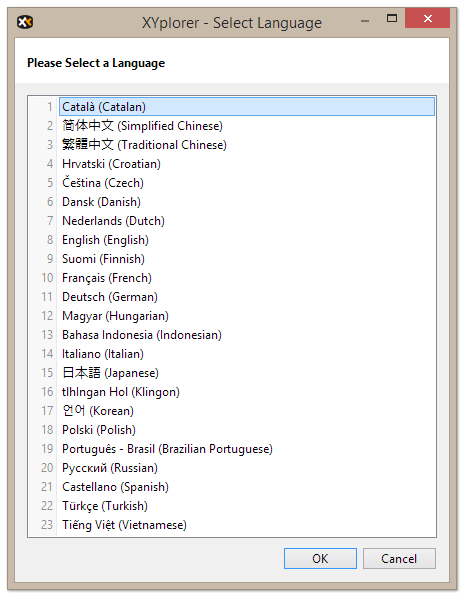 How to load the Catalan language into XYplorer: Click menu Help | Select Language, then select Catalan from the list of available languages. Done. No restart required.